Welcome North Amherst Pharmacy to The Mill District! AMHERST MA: Riverside Park Shops’ newest venue is now open – a full-service pharmacy with all your health and beauty needs. Located next to the awesome Pizza House of Amherst, Cumberland Farms, and North Amherst Post Office in The Mill District – it’s so convenient for all your prescription needs. Please help spread the word and welcome our new neighbors! A locally owned pharmacy on College Street will open a second store in North Amherst village center by this spring, an indication that independent stores are competitive in a field dominated by chain pharmacies such as CVS, Walgreens, Target, and Wal-Mart. John Nikitas, who began the Amherst Pharmacy in late 2011, said he intends to have the new store open at Riverside Park Shopping Plaza on Montague Road within two to three months. Nikitas said it is a good time to be an independent pharmacy, pointing to the planned merger of Walgreens and Rite-Aid and the coming takeover and rebranding of Target pharmacies by CVS. “Local pharmacies are making a comeback because there’s so much consolidation in the industry,” Nikitas said. Nikitas, of Belchertown, said he runs a full-service pharmacy that can fill prescriptions and compound over-the-counter medication, and has numerous other supplies tailored to the needs of customers. In general, he said the price people with health insurance pay for medication at his store is identical to the costs at a national chain. And if they are paying cash, prices tend to be lower — even though he typically pays more for the products. “They have great buying power, but more labor needs,” Nikitas said, referring to the national chains. The competition is also stiff because the national chains can make offers that he cannot. When CVS bought Caremark, for instance, it began offering mail order and can also give a discount on one co-pay every three months, a provision in providing prescription medication that he cannot match. Still, the federal Affordable Care Act has meant increased volume of customers and greater ability for people to access medication, even with a decreased reimbursement. Compounding services: One of the services Nikitas offers is compounding of medication, something many local pharmacies no longer do. Compounding allows Nikitas to take doctors’ prescriptions and put them in dosages for people with special medical requirements. Nikitas explains that he uses an aseptic technique to minimize contamination, taking block powders — the raw ingredient for medication — and placing them inside equipment, including a safety cabinet he calls a hood, where he makes a suspension or a cream from the medicine. 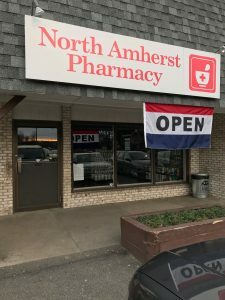 Besides individuals and families, the Amherst Pharmacy also serves group homes, offering special bubble packing of medication for pick up and sometimes delivery, Nikitas said. The bubble packing allows better recording for administrators at group homes of how the medication is being distributed to patients. Few independents: Nikitas’ decision to open a second pharmacy comes as just a handful of locally owned and operated pharmacies remain in the region, including Serio’s Pharmacy in Northampton, Center Pharmacy in Granby and the Williamsburg Pharmacy. Pharmacist Paul Serio at Serio’s said the challenges are numerous for locally owned shops, including lower insurance reimbursements and wage increases for employees, and the manner in which people fill prescriptions, with insurance companies pushing patients toward mail-order. Massachusetts does not allow medication to be sent by mail from pharmacies. But Serio said he is confident that he is giving people identical prices on products as the chain pharmacies. “They will pay the same if they come to us or anyone else,” Serio said. A loyal customer base has sustained Serio’s Pharmacy since it opened in 1950, he said. “It’s a business that will be here as long as there is support from the community,” Serio said. And Lee Lalonde, owner of Center Pharmacy, said business is good and that the continued success of the pharmacy his father began in 1953 depends on understanding and caring for the needs of patients. “The biggest issue is the insurance reimbursement and the misconception of a lot of patients that they need to go to a certain location and nowhere else, which is usually false,” Lalonde said. People who pay out of pocket will often discover buying from an independent pharmacy is cheaper. “What will separate an independent from a chain operation is our cash prices are always vastly better,” Lalonde said. However, Serio’s suspended its practice of compounding medication and that is also not a service offered by Lalonde, who said it would be prohibitively expensive to purchase the equipment. North Amherst plaza: Meanwhile, Nikitas will open his second pharmacy in space used by Captain Video from 1996 until it closed in June in the North Amherst shopping plaza owned by the family of the late Paul C. Jones. It is considered a sister company of W.D. Cowls Inc.
W.D. Cowls President Cinda Jones said there was interest in the vacant space from two current tenants that could have expanded, Cumberland Farms and the Pizza House of Amherst. But Jones said company officials decided it was important to have a variety of enterprises in the village center. “We want a walkable, shopable and diverse retail space,” Jones said. In fact, the company is accepting lower rent for the space to encourage what she believes is a better mix of tenants. The College Street store, which has three employees, is open from 9 a.m. to 5 p.m. weekdays, and 9 a.m. to 3 p.m. Saturdays. The North Amherst store will likely offer longer hours, because it will be situated in a busier plaza, and will have four employees, including a pharmacist and registered pharmacy technicians, Nikitas said. Francisco “Paco” Perez, who operates the adjacent Pizza House, said he is not certain of the pharmacy will help attract customers to his business. “I think it’s fine, and it might be good for business,” Perez said. But he added that he has not noticed any effect on business since Captain Video closed. “If you have a good product, people will come no matter what,” Perez said. The plaza already includes the Cumberland Farms convenience store and the Big Guy Liquors, a package store, and the post office for North Amherst. The 1,400-square-foot store is larger than what Nikitas has on College Street and will offer more supplies, including those that will be especially popular for people in North Amherst, such as sunscreen, which Jones said will be in demand when the pool at the nearby Mill River Recreation Area opens in the summer and people again begin frequenting Puffer’s Pond.